A low functioning thyroid can cause many symptoms. That is because the thyroid is involved in practically every aspect of your body. In this post, I am going to talk about ways to help hair loss from thyroid and other hormonal imbalances. Hair loss from hypothyroid is from the root. You will find full-length pieces of hair everywhere. In hypothyroid you will find hair thinning all over but particularly the top and hairline. Also, the eyebrows really take a beating in hypothyroid. There will be patches of hair missing throughout the eyebrows and the tail ends will disappear. Even body hair will reduce in hypothyroid. I had a patient that hadn’t shaved in years. And once we treated her hypothyroidism, she had to start shaving her legs again. Mood issues: Thyroid slows everything down, even your mood. Many people report once their thyroid is treated their mood improves. Blood work out of range: Hypothyroid can disrupt blood sugar, raise cholesterol and increase inflammatory markers. While having concerns over hair loss might seem superficial, it is not. It is disturbing to be losing hair and worrying if it will ever stop. Cry in my office because they don’t know how to stop the hair loss. Bring in hair that was lost in a little baggie or tissue. Send me pictures of the hair they are losing. Spend extraordinary amounts of money on special shampoos, conditioners, products for thinning hair. get blown off by their primary care or general provider because of their hair loss concerns. It is important to understand hair loss is not a “disease,” it is not going to kill you. Unfortunately, many doctors are not interested in your hair loss concerns. Because they are jaded by dealing with people that have illnesses like diabetes, cancer, heart disease. I have had patients tell me that their primary care doctors tell them there is nothing that can be done. One patient told me, her doctor told her to buy a wig. They are told hair loss is a consequence of thyroid, hormones, getting old and to just deal with it. But this is a very distressing concern, especially for women. For men, it is more socially acceptable to have thinning hair or baldness compared to women. With that said, I would like to provide you with some ideas to help with hair loss from hypothyroid and other hormonal imbalances. Thyroid medication: If your thyroid is underactive, taking thyroid medication will help improve the overall function. If you are having symptoms of hypothyroid and excessive hair loss, have a blood test to check your thyroid. If you are interested in the different types of thyroid medication click on the link to listen to our podcast Episode 021. Thyroid Testing: If you are interested in thyroid testing, click on the link to our podcast Episode 019 that is all about thyroid labs. Raise T3: Bear with me as I try not to bore you with the physiology of thyroid hormones. This is going to be short and sweet and will not include every detail of how the thyroid functions. The brain releases TSH (thyroid stimulating hormone). The TSH monitors overall thyroid hormones. The thyroid releases mainly T4 (thyroxine). Thyroxine (T4) converts to T3 (triiodothyronine). T4 has a long half-life and doesn’t have much activity other than converting to T3, which is the active form of thyroid. You can have all the T4 in your body, but if you do not have T3, then you will have symptoms of hypothyroid. The goal here is to raise your T3 or raise the conversion of T4 to T3. The TSH is not an accurate measure of thyroid function. To accurately measure thyroid, you want to include a Free T4 and a Free T3. Reduce exercise: Excessive cardiovascular exercise will decrease your conversion of T4 to T3. If you over exercise or do a high volume of intense cardiovascular exercise, you are putting a heavy burden on your thyroid and adrenal glands. Intense cardio will dramatically increase your cortisol levels which impact your T3 levels. Liver function: Your liver is the main converter of T4 to T3. If your liver is burdened or not functioning well, it cannot convert T4 to T3. Thereby reducing your T3 levels in your bloodstream. Avoiding too much alcohol, sugar, fructose and restricting medications, especially meds with acetaminophen. No starvation/caloric restriction (dieting): Restricting your calories dramatically reduces your T3 levels. Part of your T3’s function is to keep your metabolism moving at a healthy pace. If your body thinks it is starving, it will do anything to try and preserve body mass. Automatically your T3 levels drop to reduce metabolism. I remember a young teen patient that was referred to me by a colleague to address her thyroid levels. She came in with her mom and grandmother as they were concerned about her hypothyroid symptoms. She was always tired and it was starting to affect her grades, family and social life. Her TSH was in range and even looked like she was HYPER-thyroid. Her T4 levels were normal. But she has very low levels of T3. I had seen her a couple years before and noticed that she had lost a considerable amount of weight. In fact, she was incredibly thin. And she was on a restricted diet for her food allergies. But when we talked some more she started crying that she was fat and did not want to get “fatter”. She wanted to be on thyroid medication for her energy and metabolism. I am not a eating disorder practitioner. And I will be the first to say, I am not a expert in eating disorders. But it turned out she was anorexic. And privately I gave her grandmother a name of a eating disorder therapist, which she eventually, continues to see. What I am trying to say here, dieting in any manner that reduces caloric intake is going to drop your T3 levels. We all should endeavor to eat healthy. But caloric restriction will not help your hair loss and ultimately will not maintain weight loss. Chronic Ketosis: A keto diet is a great way to lose weight (especially belly fat) and balance insulin and cortisol. Being in ketosis for an extended amount of time is hard on the thyroid and causes a drop in T3. This is why many people complain the keto diet caused their hair to fall out. Because they were in ketosis too long and needed to cycle in carbs every once in a while. Also, ketosis reduces appetite, so you have to be careful not to drop calories too much. If you are going to do a keto diet, make sure it is properly managed. You can download our free guide to healthy ketosis and carb cycling which we call, The Keto-Carb-Cycling-Program. Sleep: Sleep deprivation can cause hair loss. Make sure you are getting at least 6 hours up to 8 hours a night. Not getting enough sleep is hard on the adrenal glands. The adrenal glands will end up releasing elevated levels of cortisol. These high levels of cortisol will reduce thyroid function which can cause hair loss. High Reverse T3 levels: High levels of reverse T3 (RT3) can cause hair loss. Reverse T3 is inert and has no activity. Sometimes T4 will convert to RT3 instead of free T3. Higher levels of RT3 and lower levels of free T3 can cause symptoms of hypothyroid and hair loss. This is common when people are taking higher doses of T4 medication like Synthroid or levothyroxine. If you are taking Synthroid/Levothyroxine and your TSH is normal, but you still feel like you are hypothyroid. Check your Free T3 and Reverse T3 levels to make sure your medication is not converting to RT3. These factors may not be a direct influence from hypothyroid, but they are relevant to unexplained hair loss. I have had many patients convinced their hair loss is from their low thyroid. But in reality, it is a combination of thyroid and other factors. Or their hair loss is completely unrelated to their thyroid. Low Iron levels: Having low blood iron/anemia can cause hair loss. Make sure to have your iron levels checked if you are having hair loss. For females, they might be losing too much blood during their periods. This will cause anemia and hair loss. Giving a iron supplement (non-constipating one) will help replenish the iron. And balancing hormones so that the blood loss from the periods is resolved will help prevent anemia. When testing for iron levels, most doctors will order a complete-blood-count (CBC). A CBC will show levels of red blood cells, the hemoglobin and hematocrit. If the hemoglobin and hematocrit are low then that points to anemia or low iron levels. If the red blood cells are low, that too means anemia. But often times a person’s CBC is normal. Which is why checking ferritin levels are important when someone is having unexplained hair loss. Ferritin is not iron, but it is a protein that binds to iron. It helps us find out if the iron storage levels are low. It can be common for someone to have normal red blood cells, normal hemoglobin and hematocrit, but low levels of ferritin. Low levels of ferritin can cause hair loss. People also report having fatigue and a chronic low level headache with low ferritin. If you are worried about hair loss, make sure you have your ferritin levels tested as well as a CBC. If your doctor will not order a ferritin level for you, order it yourself on our website. High Androgens in Females: Having high levels of DHEA or testosterone can cause hair loss. Usually, with high androgens, you will notice hair loss in temples and top of the head. 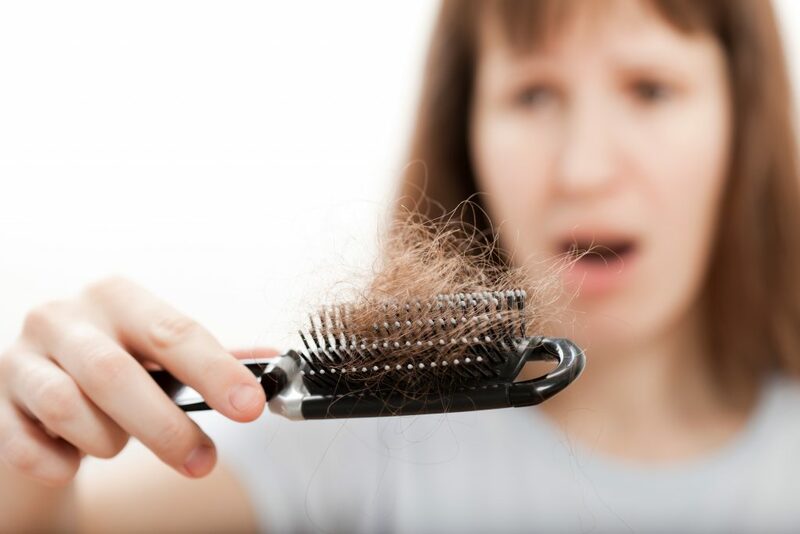 People with Polycystic Ovarian Syndrome (PCOS) make excess testosterone causing hair loss. But I have many patients that do not have PCOS, yet they have higher than normal levels of testosterone. If you do not have PCOS but have hair loss, get your testosterone and DHEA levels tested. There are ways to reduce the testosterone levels. Spironolactone is a medication that is often given to women with high levels of testosterone. Spironolactone will reduce testosterone levels quite effectively. Bioidentical progesterone can balance the testosterone levels to help with hair loss. Many doctors give birth control pills to reduce testosterone levels, although this would not be my first option for hair loss. Taking saw palmetto in some cases can reduce a female’s testosterone levels as well. Exogenous Androgens: This is VERY common. If you are a female and taking testosterone or DHEA that can very well cause hair loss. Testosterone can be given for many reasons. Testosterone is often given as part of hormone replacement. But it can also be used for libido or building muscle. DHEA is a precursor to testosterone. Many women and men take DHEA supplements because it is helpful for raising testosterone levels and can be beneficial for aging. Either way, if you are taking testosterone or DHEA, be sure to test the levels. If they are too high for you, that will cause hair loss. One time I was at my gynecologist’s office talking with the office manager. She was concerned because all the hair in her temples had fallen out. I told her that she needed to talk to her doctor and have him/her reduce the amount of testosterone in her hormone replacement. She was shocked and said, ‘how did you know I was on testosterone??’. Because that is one of the main symptoms, you will see if the testosterone is too high for that individual. ‘Lisa’, my trainer is a great example. I noticed she was having some pretty bad acne on her cheeks all of a sudden. I didn’t say anything, but she mentioned that she was losing her hair. I didn’t want to state the obvious but asked how long has it been going on and has she noticed any other changes, like “skin issues”. Lisa said she had been breaking out in cystic acne on her face and back recently. And her hair was coming out in handfuls. She was really worried that something serious was wrong with her. I asked her if she started any new medications or supplements of recent. Lisa said, “not really, but I am taking a new vitamin that helps with weight training and building lean muscle”. Turns out this supplements was very popular around the gym and a lot of trainers were taking it. And it happen to have 50 mg of DHEA in it. That high level of DHEA was causing acne and hair loss. A man should be able to tolerate 25-50 mg of supplemental DHEA. But for us ladies, taking that level would instantly cause hair loss, acne and feeling irritable (“testy”). Most women cannot tolerate more than 15 mg of DHEA, and even that can be too high. Usually DHEA in levels of 5-10 mg is the common dosage for a woman. Another example is my patient, “Joan.” Joan came to her appointment and was concerned because her hair was falling out. I noticed she was breaking out on her face and she also mentioned she was very irritable. Her levels of testosterone were three times the normal level. And I did not have her on any testosterone or DHEA. But it clicked right away. I asked Joan if her husband was using a testosterone cream to increase his levels. She said that he was, but he was careful not to get it on her. I told her to go home and ask him if he was applying the cream to his bum. Testosterone is absorbed well in an area of fat tissue, like the bum or inner thigh. Joan’s husband was putting his testosterone cream on the back of his leg and bum. Because of this, the testosterone cream was getting on the toilet seat and transferring to Joan when she would use the bathroom. This actually happens a lot. Men taking testosterone creams or gels to treat Low T and inadvertently getting on another member of the household or even pets. Perimenopause and Menopause: When the hormones drop in perimenopause or cease altogether in menopause that can cause hair loss. Estrogen and progesterone are great for hair, so when they decline the hair can thin, fall out or change in texture. Also when the estrogen and progesterone are low, that makes normal levels of testosterone seem falsely elevated. This can also cause hair loss. Balancing the hormones can help with hair loss in perimenopause and menopause. Bioidentical hormone replacement can help with hair loss. But not everyone is a candidate for BHRT. Evening primrose oil can be helpful in perimenopause and menopause for hair loss.